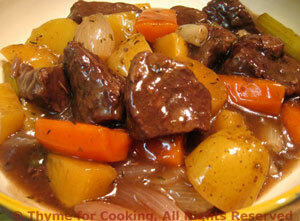 Thyme for Cooking Sunday Supper: Beef and Root Vegetable Stew. Another slow-cooking dinner for Sunday. If you use very tender beef, it could be done in an hour, or it could be cooked very slowly, on the cook top or in a crock pot for several hours. There will be enough for 2 meals.